Have you tried making your own infused waters? 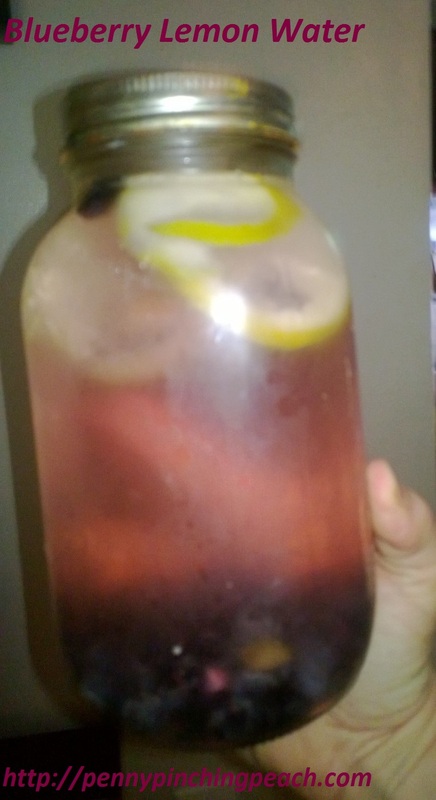 My first taste test was blueberry lemon infused water. My next flavor fling was key lime infused water. 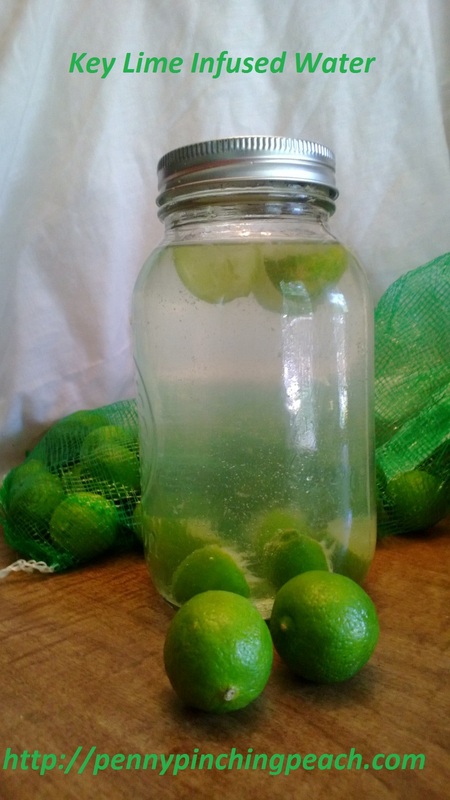 I quartered two key limes, squeezed them into the jar, and filled it up with water. I also added two tablespoons of sugar melted into some hot water, because I figured it would be way too tart and kinda icky on it’s own. I think I was right, but it would’ve been smarter healthwise if I had just used a tablespoon of honey or something. 🙂 It didn’t make it sweet at all, just cut the sour a bit. This one only worked for two refills, but may’ve worked for more and a stronger flavor with a large lime or more key limes. I liked the blueberry lemon better, but this still had a nice little zest. My third fruity concoction to check out was mango infused water. I sliced up half of a mango into my jar, filled it with water and shook it, letting is sit overnight. It had a pleasant mellow mango flavor to it that lasted through a couple of refills. Try it! My fourth taste test to share was blackberry infused water! I’d just picked a big jug full of blackberries and wanted to see how it was. It came in a close second to the blueberry lemon on the taste test and the water color was a beautiful purple. By this point, my sweet husband had taken note of my new fun water trick and bought me a really pretty fruit infusing water bottle! My final creative flavor combination to share is cucumber and key lime infused together! To sum it up, I’d definitely recommend doing your own infused waters if you like a little flavor in your beverages and are trying to drink more water! Don’t expect it to be as strong of a fruity taste as juice, but it is very pleasant and certainly makes me reach for my water a little more frequently than always drinking it plain. Adding a bit of citrus like lemon or lime to whatever fruit definitely seemed to amp up the flavor of the “host fruit”, from my little experiments. Play with the flavors. It’s fun! I’m thinking of trying pineapple or peaches next. What fruit would you try to infuse first? Need some healthy snack ideas to go with that refreshing water you’re going to be sipping? Head over to Super Yummy Don’t-Tell-Them-They’re-Healthy Snacks! Categories: Cooking With Coupons, Frugal Family | Tags: fruit infused water, how to drink more water, infused water, making water taste better, ways to drink more water, ways to make water taste better, what to do when you don't like water | Permalink. I totally just discovered infused water and it is awesome. I will definitely have to try the mango one you have listed above! Thank you for linking up last week to Friday Favorites! Hope to see you this weekend too! It’s fun trying quirky new flavors! Things have been hectic and hot here! We’re going through some huge transitions, plus our son had an accident a couple of weeks ago that resulted in about 40 stitches and a fractured skull. He is going to be okay, but it’s a long road. Anyway, this heat got me thinking about some of my favorite refreshing drinks. I had to re-share these with y’all! Please share with your friends who could use some cooling off! Happy summer! !